Pareto Chart | Pareto Principle | What is Pareto Chart in 7 QC Tools? 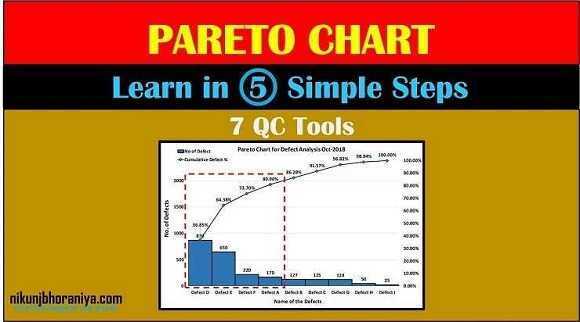 Home7 QC ToolsPareto Chart | Pareto Principle | What is Pareto Chart in 7 QC Tools? What is Pareto Chart in 7 QC Tools? 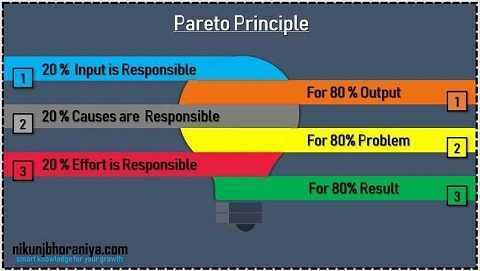 → Pareto Chart was invented by Vilfredo Pareto. → Pareto Chart is a diagram that shows the order of the largest number of occurrences by item or by classes and the cumulative sum total. → It is a combination of a bar graph and line graph. → A bar graph is arranged in descending order of height from left to right while a line graph represents the cumulative percentage. 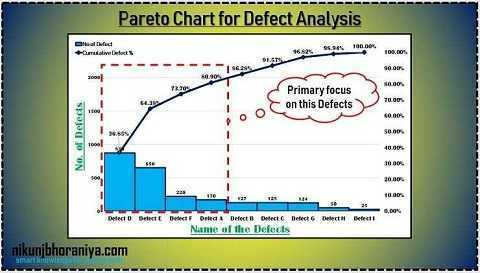 → The bar graph shows the number of defects and the line graph shows the cumulative percentage of the defect. → It is a very important tool of Basic 7 QC Tools. → Vilfredo Pareto was an Italian engineer, sociologist, economist, political scientist, and philosopher. → He shows an observation that is: "80% of the land in Italy was owned by about 20% of the population." → He introduced the concept of efficiency and helped to develop the field of microeconomics. → The Pareto principle was named after him. → He also contributed to the fields of sociology and mathematics. → 80% of the Problems come from 20% of the causes. → 80% of the Outputs come from 20% of the Input. → It Distinguishes between Vital Few from Trivial Many. Sort data & calculate the cumulative frequency. Draw the axes, Construct the bars, Draw the cumulative percentage line, Title and label the chart. Identify Vital Few from the Trivial Many by using 80:20 principle & plan further action. ➝ Select the problem for investigation. ➝ Determine the method of collecting data and a period of data collection. ➝ Design a separate check sheet if necessary. ➝ E.g. : Defect analysis. ➝ The second step is data collection for the graph. ➤ Step 3. Sort data & calculate the cumulative percentage. ➝ After the collection of data, the third step in the Pareto chart is to sort out data and find the cumulative percentage of data. ➝ After sorting out data and find the cumulative percentage, Draw the axes, Construct the bars, Draw the cumulative percentage line, Give Title and labeling the chart. → From step 4: as per the Chart, we have Identify Vital Few ( i.e. 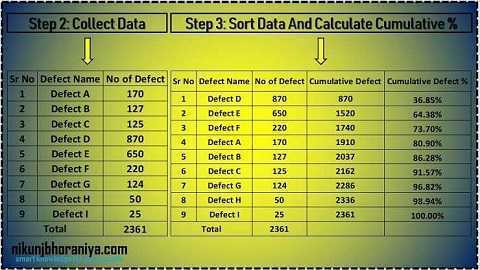 defect D, Defect E, Defect F and Defect A ) from the Trivial Many (i.e. All defects ) as per 80:20 Rule. → Now we will take action on these defect by finding the root cause of defect generation and implement preventive action on it. → We can easily distinguish between Vital Few and Trivial Many. → It displays the relative importance of causes of the problem. → Helps the team to focus on those causes that will have the greatest impact when solved. → By using 20% of resources we can solve 80% of problems.